Hardy to zone 5, peach trees have a life expectancy of 20 years and grow to heights of 15 feet at maturity. Closely related to plums, cherries and apricots, peach trees originated in China, eventually arriving in the U.S. in 1629. Peach trees are self-pollinating, and established peach trees will begin to bear fruit two to three years after planting. If you live in Ohio, which is within USDA hardiness zones 5 and 6, you can grow a peach tree in your backyard that will eventually yield you a 30- to 50-lb. harvest. 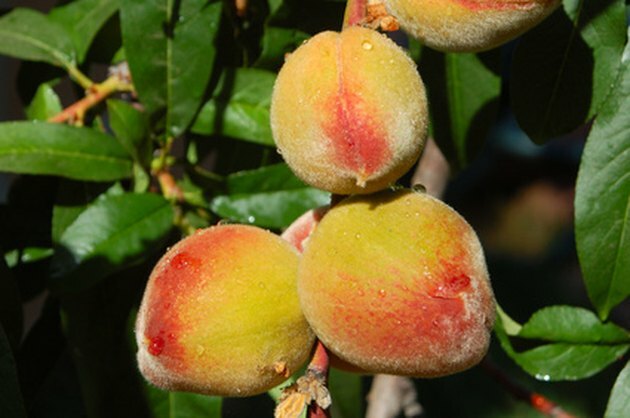 Peach trees produce fruit two to three years after planting. Remove the peach seed from the raw fruit. Rinse the seed in clear water and remove any attached pulp. Peach seeds require stratification, and fall planting, along with the winter frost, will provide the chill that the peach seed needs. Choose an area that contains full sun and well-drained soil. Peach trees prefer to grow in soil with a pH between 6.0 and 7.0, and Ohio soil tends to be neutral to alkaline. Test your soil to determine its acidity. Use a soil pH test purchased from a nursery or garden center. Break up the soil with a pitchfork and add the required amendment. If the soil pH test measures below 6.0, add lime. For a pH above 7.0, add peat moss. Mix in either amendment according to manufacturer's instructions. Sow the peach seed in the soil at a 1/2-inch depth and gently pat the soil over top. Place a 8-by-8-inch piece of metal screening over the planting spot and lay a heavy stone on each corner to hold it down. The screening will keep the peach seed safe from hungry Ohio squirrels and other forms of wildlife. Water the planting area thoroughly using a soaker hose. Provide the soil with 1 inch of water per week, maintaining moisture at a depth of 1 inch at all times. Discontinue watering during the winter if there is snow on the ground or periods of heavy rainfall. Resume watering after the winter thaw. Apply a 4-inch layer of mulch after planting the peach tree seed. Covering the seed with straw, pine or bark chips will help with drainage and also help to protect the peach seed from the cold Ohio winters. Maintaining a layer of mulch over the planting site will help to reduce weed growth during the growing season. Place a tomato cage around the peach tree when the seed begins to germinate in the spring. The tomato cage will protect the young seedling from Ohio wildlife. Remove the cage when the peach tree sapling reaches a height of 1 foot. Hammer a bamboo stake into the ground and attach the peach tree to the stake with a piece of cut pantyhose. The pantyhose will not mar the sapling's outer wood.